Flavorful, invigorating and refreshing red tea for everyday consumption. 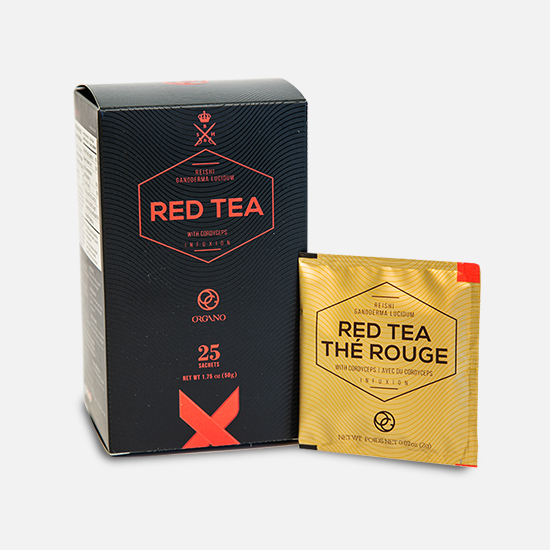 Organo Red Tea is a flavorful and aromatic tea with ganoderma lucidum and cordyceps. This ganoderma tea is naturally rich in antioxidants, to enjoy hot or chilled with ice anytime of the day. Contains organic Ganoderma lucidum, used in Chinese tradition for its immune benefits. Organo Red Tea is a flavorful and smooth red tea with ganoderma lucidum and cordyceps mushroom powders. Great for anyone that wants to add more antioxidants into their diet with this fresh and light tasting red tea. Cordyceps – grown in a mineral-rich soil at high altitudes and low temperatures and is a celebrated mushroom used for centuries in traditional Chinese culture. Cordyceps were historically reserved for the Emperor’s highest court and Chinese nobility. 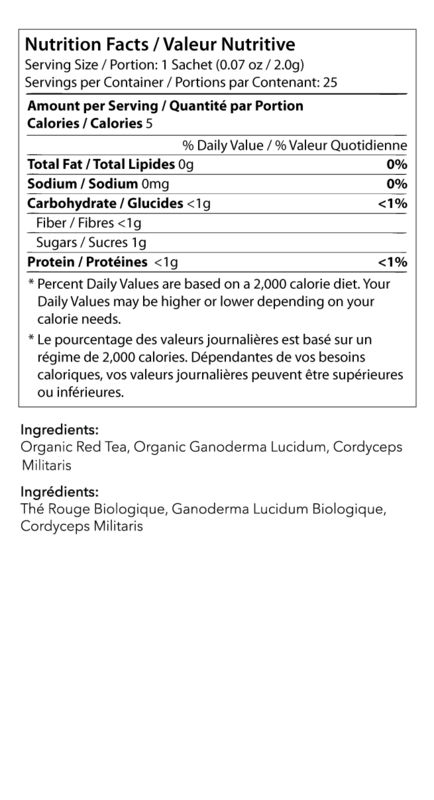 Cordyceps is also used by athletes to support energy and performance. 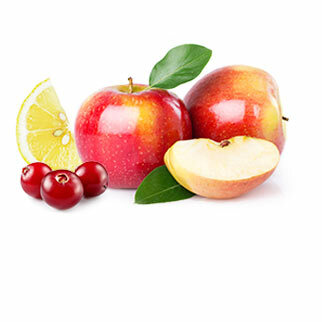 Polyphenols – are natural antioxidants that help fight the negative effects of oxidative stress, and helps support the immune system, a healthy heart, healthy brain and more. Theanine – An important amino acid that supports dopamine to bring you a general feeling of calmness and can help support healthy blood pressure and healthy blood sugars. Place the tea bag at the bottom of the cup and pour the hot water on top to your desired level. Freshly boiled water, rested for a 2-3 minutes so the temperature drops to 140-185°F (60-85°C), is the ideal temperature for when you pour it. Make your own flavors by adding ginger, honey, sugar, or milk. Chill and serve cold over ice with fresh mint or lemon. 1. Place ORGANO Red Tea bags in a large heatproof bowl; add boiling water. Cover and steep for 8 minutes. 2. Discard tea bags. Add the remaining ingredients to tea; stir until sugar is dissolve. NOTES: Pumpkin Pie Spice Blend can be found at stores. However, you can also prepare your own by mixing the following spices in a spice jar: 1 ½ Tbsp ground cinnamon + 2 tsp ground ginger + ½ tsp ground nutmeg + 1 pinch of ground cloves.